If you are looking for the perfect gift for an alumni, graduate, or mother of a student at Ohio State University, then the Chelsea Taylor Block O Swarovski Crystal Bead is the one. Are you looking for the perfect gift for an Ohio State University graduate, alumni, student, or fan? If you are, you may want to consider the gift of a Chelsea Taylor Swarovski Crystal Block O Bead that will fit on any add a bead jewelry, including Pandora, Trollbeads, Chamilia, or Biagi bracelets and necklaces. The Chelsea Taylor bead is a three sided bead, each side with the OSU block O outlined in Swarovski Crystal rhinestones, one color on each side, red, gray, and clear. The bead itself is rhodium plated sterling silver, and has a wide enough hole to fit on any Pandora style bracelet. While the picture of the Chelsea Taylor Swarovski Crystal Block O Bead to the right is a good one, there is no way to adequately capture the true beauty of the bead, which looks just as good by itself, as it does in combination with other beads. The true beauty of the bead is in the elegant design, and the high quality of unsurpassed Swarovski Crystal rhinestones that add both color, and dimension. The rhodium plating keeps the sterling silver from tarnishing, so you do not have to worry about keeping the bead in a tightly sealed package nor polishing it before each wearing. If you order this bead from Chelsea Taylor, you can expect a 6 to 8 week lead time before you will get the bead. Many dealers do not stock enough of the beads to fulfill their orders, and have to wait for deliveries from Chelsea Taylor. To help customers get the beads in a much shorter period of time, Lake Erie Artists Gallery works hard to keep the Chelsea Taylor Ohio State bead in stock at all times. The bead is quite popular with OSU fans, and Lake Erie Artists Gallery will post on the website when they are in or out of stock. 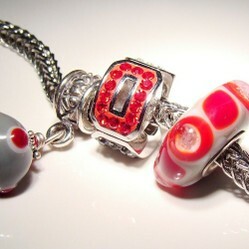 In addition to this lovely OSU bead, Lake Erie Artists Gallery also carries a full line of scarlet and gray, buckeye, and other Ohio State University lampwork beads made by The Velvet Box, a Cleveland, OH company. The Velvet Box, a family owned Cleveland company, makes a full line of school spirit beads. Due to the fact that they are based in Ohio, the OSU collection is the most popular of their school spirit line, and Lake Erie Artists Gallery stocks the OSU colors, and beads at all times. But if you are from another part of the country, then you can order these beads in your school colors, and The Velvet Box will make them to order in about 2 to 3 weeks. The Velvet Box makes beads from molten glass, using a lampwork bead technique, then lines each bead with sterling silver. These beads are a beautiful addition to any add a bead bracelet or necklace line, and they also look great on any leather or silver cord. Lampwork beads are made by hand, one at a time, on a flaming torch using glass rods. The artist makes each bead, one color at a time, using a different piece of glass to create all of the design elements for each bead. It is very difficult to have a steady hand when making lampwork beads, and the high quality of the beads made by The Velvet Box is evident in each bead. They are truly a tiny piece of art. If you would like to order any of these beads or see more beads that will fit on your Pandora or Trollbeads jewelry, click on this link to go to Lake Erie Artists Gallery. I had first learned about these beads from you and agree, they are so gorgeous. They exude such beauty and craftsmanship I really must look into this type of jewelry for myself. They are. About 20 times more in person than on screen. I have no clue about arts & crafts 'n stuff, but these beads look gorgeous, Paula.